Proposed change for 26 Thornwood road. The clients of this Victorian terraced house wish to extend their kitchen to be able to live and eat together more frequently as a family and have clear access to the rear garden. The proposal offers extra storage space and a space for a sofa and chair. This extension will add an extra 19.5 m2 to the existing house and is in addition to the existing kitchen. The kitchen is accessed via the hall corridor where a new door to it will be located. 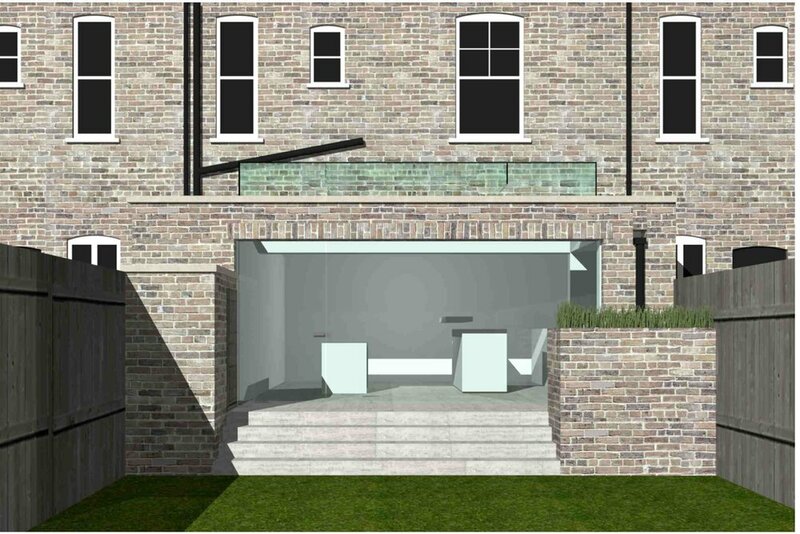 The extension is to be built out of London stock brickwork to match the existing rear wall of the house. The extension will have a concrete floor, level with the existing floor that extends to form an outside deck and steps down to the lawn below. The roof will have a glass upstanding box built with structural glass beams. In terms of composition, this box mimics the loft dormer, which is a raised box-like structure springing up from out of the eaves. This skylight similarly springs up out of the horizontal façade of brick. Compositionally, the extension is designed to be read as a predominantly horizontal arrangement with a horizontal band of brick soldier course supported above the window opening. The window opening is also horizontal in proportion. It is to be made up of a single glass door with the rest being a fixed frameless glass panel. The deck is contained by a brickwork and timber slatted seating area on one side (with storage below and planting above) and a small brickwork storage unit with timber doors on the other side. The brickwork for both the storage unit and the bench will match the existing brickwork of the house and proposed extension. The brick storage unit has a mono-pitched lead covered standing seam roof which at its highest point is level with the top of the existing fence. The proposal includes a new timber fence to run the length of the garden, level with the top of the storage unit. The lawn slopes down at the back of the garden, making the fence 2.5m at its highest. The clients wish to have this as a continuously level fence, as opposed to the presently stepped fence, in order to screen views of the neighbouring summerhouse. This summerhouse is a substantial timber construction (that may not have gained planning permission) and is an eyesore to the clients. In conclusion, this extension shall provide much needed communal space for a family of working parents; whose time together is important to them. Its subtle horizontal composition with springing glass skylight is both expressive and modest. The extension is only 19.5m2, yet with its new deck and steps offers a new vitality to both garden and house and improves the rear façade of the house generally. At present the rear façade has a blocked in door and disjointed elevation. 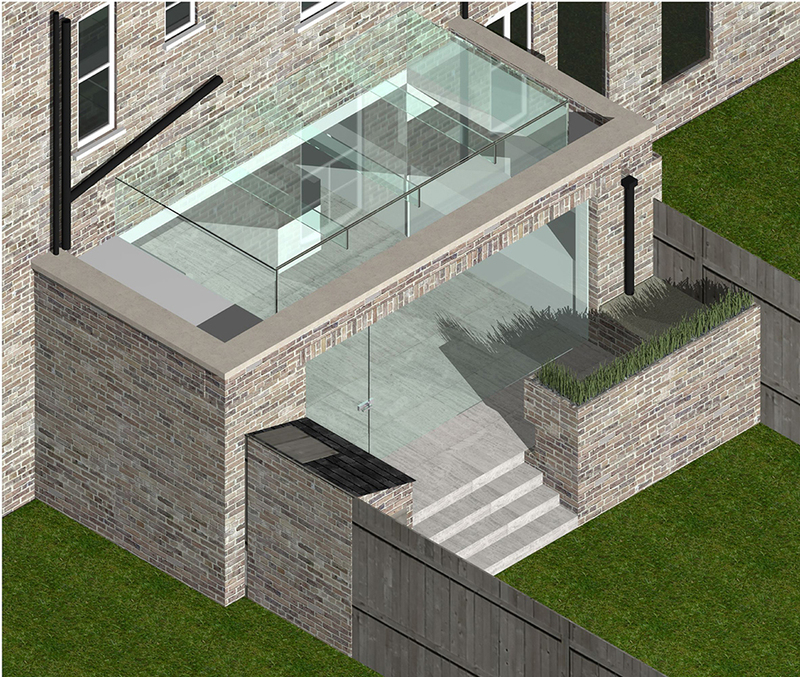 The proposed extension unites the elevation harmoniously on the ground floor. It also unites the roof, garden and rest of the rear of the house internally and externally. Proposed change to Thornwood Road, plans. Render of proposed change to Thornwood Road - additional exterior view. Render of proposed change to Thornwood Road, additional exterior view.